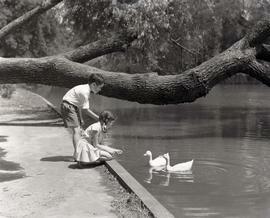 Black and white photograph of two unidentified children at a pond. Titled "Fifa" by Fred Schiffer. 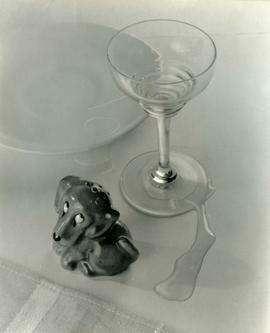 Black and white photograph called "Particular", of a martini glass with spilled liquid beside it, and a salt and pepper shaker in the shape of a dog. Black and white photograph of an office, possibly of Argentina's Kalmar company. Black and white portrait of Carlos Cores, a famous Argentine film actor and director. Black and white portrait of Carlos Thompson, famous Argentine stage and film actor. Also known as Juan Carlos Mundin-Schaffter. Black and white portrait of D. Davies and children, from July 1958.